Haem and iron homeostasis in most eukaryotic cells is based on a balanced flux between haem biosynthesis and haem oxygenase-mediated degradation. Unlike most eukaryotes, ticks possess an incomplete haem biosynthetic pathway and, together with other (non-haematophagous) mites, lack a gene encoding haem oxygenase. We demonstrated, by membrane feeding, that ticks do not acquire bioavailable iron from haemoglobin-derived haem. However, ticks require dietary haemoglobin as an exogenous source of haem since, feeding with haemoglobin-depleted serum led to aborted embryogenesis. Supplementation of serum with haemoglobin fully restored egg fertility. Surprisingly, haemoglobin could be completely substituted by serum proteins for the provision of amino-acids in vitellogenesis. Acquired haem is distributed by haemolymph carrier protein(s) and sequestered by vitellins in the developing oocytes. This work extends, substantially, current knowledge of haem auxotrophy in ticks and underscores the importance of haem and iron metabolism as rational targets for anti-tick interventions. Ticks are small blood-feeding parasites that transmit a range of diseases through their bites, including Lyme disease and encephalitis in humans. Like other blood-feeders, ticks acquire essential nutrients from their host in order to develop and reproduce. Iron and haem (the iron-containing part of haemoglobin) are essential for the metabolism of every breathing animal on Earth. Most organisms obtain iron by degrading haem and, reciprocally, most of the iron in cells is used to make haem. However, an initial search of existing genome databases revealed that ticks lack the genes required to make the proteins that make and degrade haem. Perner et al. wanted to find out if ticks can steal haem from the host and use it for their own development. To achieve this, Perner et al. exploited a method of tick membrane feeding that simulates natural feeding on a host by using a silicone imitation of a skin and cow smell extracts (“l´odeur de vache”). Ticks were fed either a haemoglobin-rich (whole blood) or a haemoglobin-poor (serum) diet. This experiment revealed that ticks can develop normally without haemoglobin, but female ticks fed a haemoglobin-poor diet lay sterile eggs out of which no offspring can hatch. Further investigation showed that haemoglobin is vitally important as a source of haem but not as a source of the amino acids needed to produce the vitellin proteins that nourish embryos. As ticks are not armed with the ability to degrade haem, they do not acquire iron from the host haem but rather from a serum transferrin, a major iron transporter protein found in mammalian blood. Further experiments revealed that ticks have evolved proteins that can transport and store haem and so make the obtained haem available across the whole tick body. Overall, Perner et al.’s findings suggest that targeting the mechanisms by which ticks metabolise haem and iron could lead to the design of new “anti-tick” strategies. Haem, the heterocyclic tetrapyrrole that conjugates divalent iron, is an essential molecule for most aerobic organisms, as a prosthetic group of numerous enzymes involved in a variety of biological processes such as cellular respiration, detoxification of xenobiotics or redox homeostasis (Furuyama et al., 2007; Kořený et al., 2013). Most organisms synthesise their own haem by an evolutionarily conserved multi-enzymatic pathway occurring in the mitochondria and cytosol. Only a few haem auxotrophs lacking functional haem biosynthesis have been described to date. Among these rare organisms that are reliant on the acquisition of exogenous haem are, for instance, a protozoan parasitic apicomplexan Babesia bovis (Brayton et al., 2007), and kinetoplastid flagellates of the genus Trypanosoma and Leishmania (Kořený et al., 2010). Some haem auxotrophs, such as the filarial nematode parasite Brugia malayi (Ghedin et al., 2007; Wu et al., 2009), acquire haem from their endosymbionts, while others, such as the free-living nematode Caenorhabditis elegans (Rao et al., 2005) obtain haem from ingested bacteria. The inability to synthesise haem de novo was also biochemically demonstrated for the cattle tick Rhipicephalus (Boophilus) microplus (Braz et al., 1999). In contrast to its benefits, haem is also cytotoxic, where free haem catalyses the generation of reactive oxygen species (ROS), causing cellular damage, mainly through lipid peroxidation (Jeney et al., 2002; Klouche et al., 2004; Graca-Souza et al., 2006). Therefore, in all living organisms, free intracellular haem has to be maintained at a low level via strictly regulated homeostasis (Ryter and Tyrrell, 2000; Khan and Quigley, 2011). This task is a critical challenge for haematophagous parasites, such as the malarial Plasmodium, blood flukes or triatominae insects that acquire large amounts of haem from digested haemoglobin (Oliveira et al., 2000; Pagola et al., 2000; Paiva-Silva et al., 2006; Toh et al., 2010). Maintenance of haem balance is even more demanding for ticks, as their blood meal exceeds their own weight more than one hundred times (Sonenshine and Roe, 2014). Despite its importance, the knowledge of haem acquisition, inter-tissue transport and further utilisation in ticks is fairly limited. Haemoglobin, the abundant source of haem for these animals, is processed intracellularly in tick gut digest cells by a network of cysteine and aspartic peptidases (Sojka et al., 2013). Excessive haem is detoxified by aggregation in specialised organelles termed haemosomes (Lara et al., 2003; 2005) and its movement from digestive vesicles is mediated by a recently described ATP-binding cassette transporter (Lara et al., 2015). Only a small proportion of acquired haem is destined for systemic distribution to meet the metabolic demands of tick tissues (Maya-Monteiro et al., 2000). In the present work, we have screened available tick and mite genomic databases and found that ticks have lost most genes encoding the haem biosynthetic pathway. All mites also commonly lack genes coding for haem oxygenase (HO) that catalyzes haem catabolism, raising the question of iron source for these organisms. Using in vitro membrane feeding of the hard tick Ixodes ricinus (Kröber and Guerin, 2007), the European vector of Lyme disease and tick-borne encephalitis, we performed differential feeding of females on haemoglobin-rich and haemoglobin-depleted diets. These experiments conclusively proved that ticks completely rely on the supply of exogenous haem to accomplish successful reproduction and that iron required for metabolic processes in tick tissues does not originate from haem. We propose that the unique maintenance of systemic and intracellular haem homeostasis in ticks represents a specific adaptation to their parasitic life style, and as such offers promising targets for anti-tick intervention. The availability of the genome-wide database for the deer tick Ixodes scapularis (Gulia-Nuss et al., 2016) made it possible to analyse the overall genetic make-up for enzymes possibly participating in haem biosynthesis and compare this data with other mites and insects (Hexapoda). Complete haem biosynthetic and degradative pathways are present in insects, represented by the genomes of the fruit fly Drosophila melanogaster (Adams et al., 2000) and the blood-feeding malaria mosquito, Anopheles gambiae (Holt et al., 2002) (Figure 1A,B). The canonical haem biosynthetic pathway is also fully conserved in the genomes of the herbivorous mite Tetranychus urticae, and the predatory mite Metaseiulus occidentalis, but is substantially reduced in the genome of the obligatory blood-feeding tick, I. scapularis (Figure 1B). The tick genome contains only genes encoding the last three mitochondrial enzymes of haem biosynthesis, namely, coproporphyrinogen-III oxidase (CPOX, [Vectorbase: ISCW010977], Figure 1—figure supplement 1), protoporphyrinogen oxidase (PPOX, [Vectorbase: ISCW023396, Figure 1—figure supplement 2), and ferrochelatase (FECH, [Vectorbase: ISCW016187], Figure 1—figure supplement 3). Corresponding orthologues could be also found in the I. ricinus transcriptome (Kotsyfakis et al., 2015) (GenBank Ac. Nos JAB79008, JAB84046 and JAB74800, respectively). Phylogenetic analyses confirmed that these genes cluster together with other Acari homologues (Figure 1—figure supplements 1–3, respectively). Another two gene sequences related to 5-aminolevulinate synthase (ALAS, Vectorbase: ISCW020754) and uroporphyrinogen decarboxylase (UROD, Vectorbase: ISCW020804) are clearly bacterial and most likely originate from bacterial contamination of the genomic DNA (Figure 1—figure supplement 4 and Figure 1—figure supplement 5, respectively). This conclusion was further corroborated by the fact that these genes do not contain introns and are flanked by other bacterial genes in the corresponding genomic regions. Evolution of haem biosynthetic and degradative pathways. Despite an incomplete haem biosynthetic pathway, the I. scapularis genome contains at least 225 genes encoding a variety of enzymes utilizing haem as a cofactor, such as respiratory chain cytochromes, catalase, and a large family of cytochrome P450 genes (Supplementary file 1). Hence, ticks must possess efficient mechanisms for the acquisition of exogenous haem, together with its intra- and extra-cellular transport to produce endogenous haemoproteins. In order to determine the origin of haem required for tick basal metabolism and development, we exploited an in vitro membrane feeding system developed by Kröber and Guerin (Kröber and Guerin, 2007). We fed I. ricinus females with whole blood (BF ticks), and, in parallel, with haemoglobin-free serum (SF ticks) (Figure 2 and Figure 2—figure supplement 1). Serum-fed ticks were capable of fully engorging and laying eggs similar to BF ticks (Figure 2). However, striking differences were observed in embryonic development and larval hatching. Embryos in eggs laid by BF females developed normally as described for naturally-fed ticks (Santos et al., 2013) and gave rise to living larvae (Figure 2). In contrast, no embryonic development was observed in colourless eggs laid by SF ticks, and accordingly, no larvae hatched from these eggs (Figure 2). To prove that haemoglobin alone, and no other component of red blood cells, is required for successful tick development, a rescue experiment was performed. From the fifth day of membrane feeding (prior to the females commencing the rapid engorgement phase), the serum diet was supplemented with 10%, 1%, or 0.1% pure bovine haemoglobin and ticks were allowed to complete feeding (S+Hb-F ticks). The presence of haemoglobin in the diet rescued the competence of embryos to develop normally and the number of larvae hatching from eggs laid by S+Hb-F ticks was comparable with BF ticks (Figure 2, bottom panels). The same rescue effect was observed for ticks fed on 1% and 0.1% haemoglobin (Figure 2—figure supplement 2) demonstrating that as little as one hundredth of the physiological concentration of haemoglobin in the diet is sufficient to maintain tick reproduction. 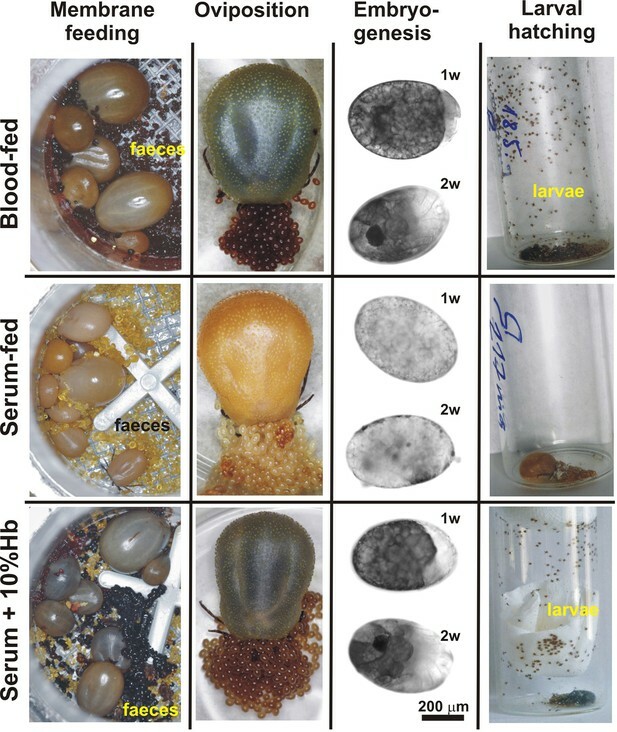 Impact of dietary haemoglobin on tick feeding, oviposition, embryogenesis, and larval hatching. After a blood meal, the physiology of an adult female tick is dominated by its reproductive effort as up to half of the weight of a fully engorged female is used in the production of thousands of eggs (Sonenshine and Roe, 2014). To disclose the importance of haemoglobin in tick reproduction, we first determined haem levels in eggs obtained from both BF and SF ticks. The concentration of haem b (the form of haem present in haemoglobin) was determined by reverse-phase HPLC (Figure 3A and Figure 3—figure supplement 1). Eggs laid by BF ticks contained 669 ± 45 pmol haem b/mg eggs, whereas eggs laid by SF ticks contained virtually no haem (only 3 ± 1.6 pmol haem b/mg eggs). Eggs from the rescue experiment (S+Hb-F ticks) contained only slightly decreased haem levels (508 ± 79 pmol haem b/mg eggs) compared to BF ticks. 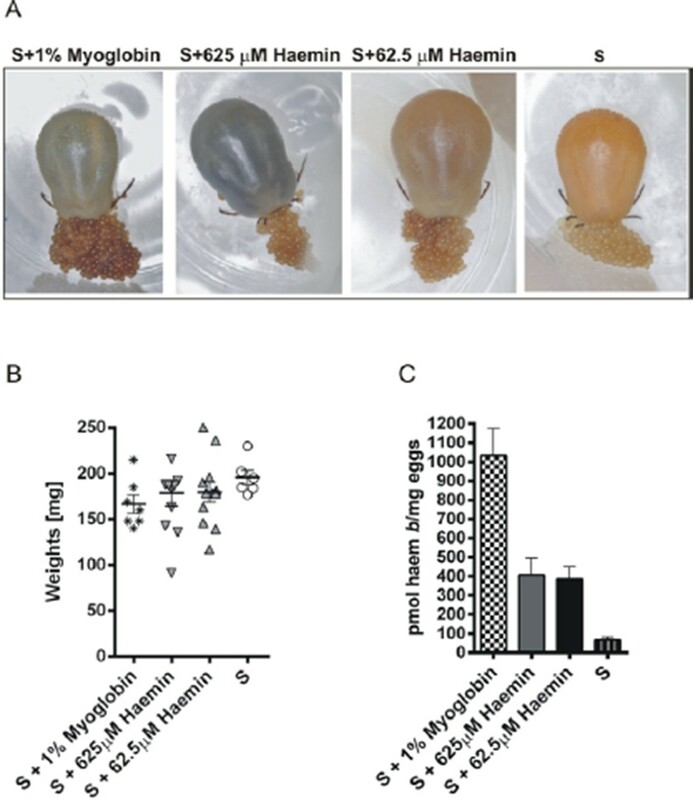 Eggs from ticks fed with sub-physiological levels (1% and 0.1%) of haemoglobin contained gradually decreasing haem levels (471 ± 17 and 229 ± 97 pmol haem b /mg eggs, respectively) (Figure 3A), but were still capable completing development and producing viable larvae (Figure 2—figure supplement 2). Determination of haemoglobin-derived nutrients in ticks (haem, amino acids, iron). (A) Levels of haem b were determined by HPLC in egg homogenates from ticks fed on whole blood (BF) serum (SF), and serum supplemented with 10%, 1% or 0.1% bovine haemoglobin (S+10%Hb, S+1%Hb and S+0.1% Hb, respectively; rescue experiments). Data (mean values ± SEM) were acquired from homogenates of three independent clutches of eggs. Representative chromatograms detecting haem b in egg homogenates are shown for BF ticks, SF ticks, and S+10% Hb - fed ticks, see Figure 3—figure supplement 1. 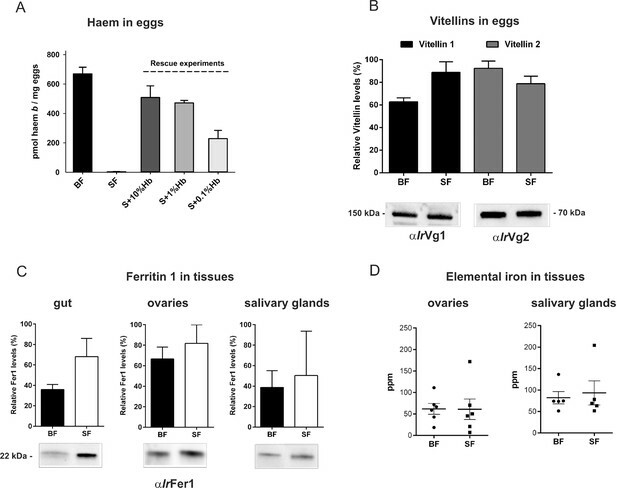 (B) Quantitative Western blot analyses detecting levels of vitellin 1 and vitellin 2 in egg homogenates using antibodies raised against vitellin precursors - vitellogenins (IrVg1, IrVg2). Bar charts depict the mean levels ± SEM of the particular vitellin in the egg homogenates from three different clutches of BF ticks or SF ticks (see Figure 3—figure supplement 2). Representative Western blot detection is shown below the bar chart. (C) Quantitative Western blot analyses detecting ferritin1 (IrFer1) in the gut, ovary, and salivary gland homogenates from BF and SF ticks. Bar charts depict the mean ± SEM levels of IrFer1 in the tissue homogenates prepared from three independent tissue pools (see also Figure 3—figure supplement 2). Representative Western blot detections for guts, ovaries and salivary glands are shown below the bar charts. (D) GF-AAS elemental analysis of iron in ovaries and salivary glands pools. Each data point represents a pool of five tissues dissected from BF and SF partially engorged ticks (fed for 6 days). Iron content is expressed in ppm (ng Fe per mg of dry tissue). Main and error bars indicate group means and SEM, respectively. Vitellins, the major tick egg yolk proteins, account for more than 90% of the protein content of a mature egg (James and Oliver, 1997; Logullo et al., 2002). In contrast to haem concentrations, no apparent differences were observed in vitellin levels in eggs from BF and SF ticks, as determined by quantitative Western blot analysis (Figure 3B) with specific antibodies raised against recombinant vitellin precursors, I. ricinus vitellogenin 1 (IrVg1) and vitellogenin 2 (IrVg2) (Supplementary file 2; Figure 3—figure supplement 2). This result implies that haemoglobin is replaceable by serum proteins as a nutritional source of amino acids needed for vitellogenesis. Genome-wide analyses of I. scapularis and other mites revealed a common unique feature; the gene encoding haem oxygenase (HO) is missing, pointing to a lack of enzymatic degradation of haem in these Acari representatives (Figure 1B). HO-mediated haem degradation results in the equimolar release of iron and the linear tetrapyrrole product, biliverdin (Khan and Quigley, 2011). Gut homogenates from fully engorged I. ricinus females were analysed by HPLC for the presence of biliverdin IX (Figure 3—figure supplement 3). With the detection limit as low as 5 pmol, no trace of biliverdin IX or modified biliverdin showing a bilin-like light absorbance near 660nm was detected in I. ricinus gut homogenates. In contrast to ticks, the presence of biglutamyl biliverdin IX in whole body extracts of the blood-fed mosquito, Aedes aegypti (Pereira et al., 2007), was confirmed by our method exploiting diode-array detection (Figure 3—figure supplement 3). The lack of HO thus poses a question of the iron source for ticks. Iron availability in tick tissues was examined using two independent methods: (i) The presence of iron was indirectly tested by monitoring the levels of intracellular Ferritin 1 (IrFer1). Under iron deficiency, the translation of ir-fer1mRNA is suppressed by binding of the iron regulatory protein (IRP1) to its 5’-located iron-responsive element, whereas at high iron levels, the proteosynthesis of IrFer1 is up-regulated (Kopáček et al., 2003; Hajdusek et al., 2009). Homogenates of guts, ovaries, and salivary glands were analysed by quantitative Western blotting using IrFer1-specific antibody (Figure 3C and Figure 3—figure supplement 2). IrFer1 levels were lower in guts and about equal in ovaries and salivary glands of BF compared to SF ticks (Figure 3C and Figure 3—figure supplement 2); (ii) The elemental iron concentration in tick tissues was determined directly by graphite furnace atomic absorption spectrometry (GF-AAS). As this method is not able to distinguish between iron of haem and non-haem origins, only salivary glands and ovaries dissected from partially engorged BF and SF ticks were used for the analysis to avoid distortions caused by the presence of haemoglobin in the samples. Despite large variations within individual biological replicates, the average iron concentration in either tissue was independent of haemoglobin in the tick diet (Figure 3D). These results conclusively proved that the bioavailable iron in tick tissues originates from host serum components rather than from haemoglobin-derived haem. 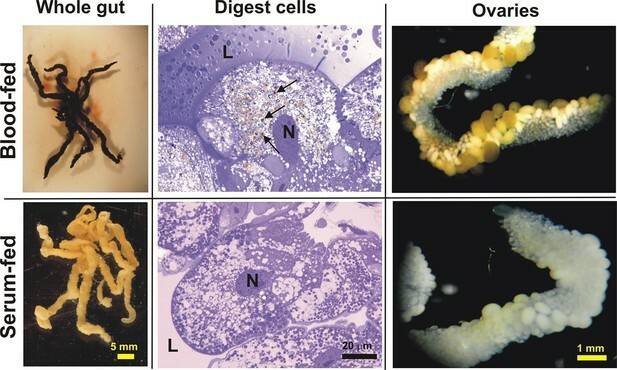 Guts dissected from partially-engorged I. ricinus females, and ovaries dissected 6 days after detachment (AD) from both BF and SF ticks displayed similar overall morphologies, except for colour (Figure 4). Accordingly, haem-containing haemosomes were not observed in the digest cells from SF ticks (Figure 4). Haemolymph collected from BF ticks displayed a typical haem light absorbance maximum (Soret peak) around 400 nm, which is not present in haemolymph from SF ticks (Figure 5A). This observation demonstrates that haem present in the haemolymph of fully engorged females originated only from the blood meal of adults, and not from previous feeding at the nymphal stage. We estimate that out of approximately 10 µmol of total haem acquired from a tick blood meal, only about 100 nmol (~1%) needs to be transported to the ovaries within a period of several days. Appearance of the tick gut, digest cells, and ovaries from blood- and serum-fed ticks. Whole guts from blood-fed (BF) and serum-fed (SF) partially engorged females (fed for 6 days) were dissected and semi-thin sections of digest cells were prepared and stained with toluidine blue. L - lumen; N - nucleus; arrows point to developing haemosomes that were present only in digest cells of BF ticks. Ovaries were dissected from BF and SF fully engorged females 6 days after detachment from the membrane. IrCP3 is the major haem-binding protein in I. ricinus haemolymph. (A-C) Ir-CP3 and haem levels in haemolymph collected from blood-fed (BF) and serum-fed (SF) partially engorged females. (A) Absorbance spectra of haemolymph samples from BF and SF females. (B) SDS-PAGE of haemolymph samples from BF and SF ticks. Protein profiles were visualized using the TGX Stain-Free technology (TGX). (C) Native pore-limit PAGE of heamolymph proteins stained with Coomassie (CBB) and specific co-detection of haem using peroxidase reaction with 3,3´-diaminobenzidine (DAB). (D-F) Effect of RNAi-mediated silencing of ir-cp3 on the Ir-CP3 and haem levels in tick haemolymph. Unfed I. ricinus females were injected with gfp dsRNA (gfp, control group) or with ir-cp3 dsRNA (ir-cp3 KD group) and ticks were allowed to feed naturally on guinea pigs until partial engorgement (fed for 6 days). (D) Absorbance spectra of haemolymph samples from from gfp control and ir-cp3 KD silenced ticks. (E) SDS-PAGE of haemolymph proteins (10 µl, 1:20 dilution) collected from gfp control and ir-cp3 KD ticks. Protein profiles were stained with Coomassie (CBB). 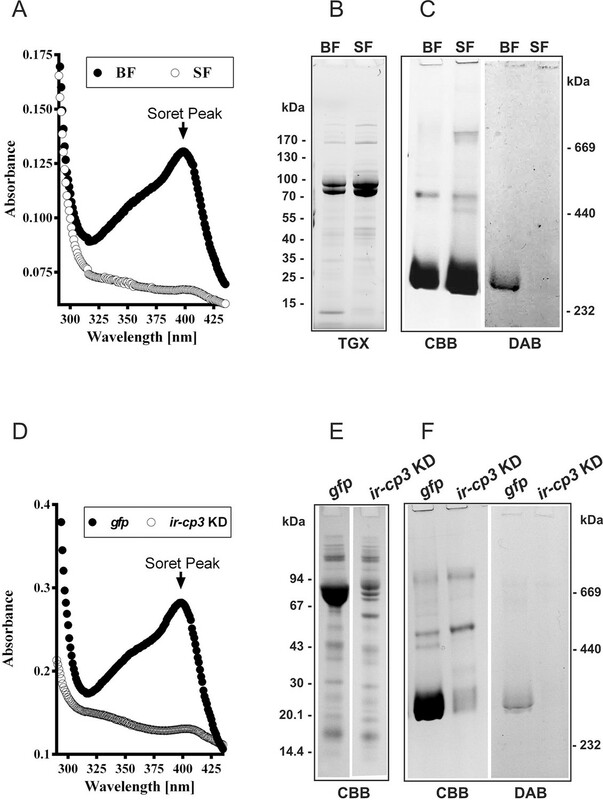 (F) Native pore-limit PAGE of heamolymph proteins from gfp control and ir-cp3 KD ticks. Protein profiles were stained with Coomassie (CBB) and haem was co-detected using DAB. Haem inter-tissue distribution and storage is facilitated by haem-binding protein(s). In the cattle tick R. microplus, the most abundant haemolymph protein, named HeLp, was reported to bind haem in the haemocoel (Maya-Monteiro et al., 2000). The genome of I. scapularis contains at least five genes related to HeLp, annotated as carrier proteins (cp1‒5). In I. ricinus, we identified and sequenced the cp3 orthologue, further referred to as ir-cp3 (GenBank KP663716). Expression profiling over I. ricinus developmental stages and tissues revealed that ir-cp3 mRNA was consistently up-regulated by blood-feeding and was predominantly expressed in the trachea-fat body complex and, to a lesser extent, in salivary glands and ovaries of adult females (Figure 5—figure supplement 1). SDS PAGE and Western blot analysis revealed that IrCP3 was most abundant in tick haemolymph (Figure 5—figure supplement 1), where its levels were not affected by the presence or absence of haemoglobin in the tick diet (Figure 5B,C). Native pore-limit PAGE, followed by detection of haem via its peroxidase activity with 3,3’-diminobenzidine (DAB), showed that haem was associated with the ~ 300 kDa band of IrCP3 only in the haemolymph from BF ticks (Figure 5C, DAB panel). RNAi-mediated silencing of ir-cp3 in I. ricinus females (ir-cp3 KD) resulted in the disappearance of the haem Soret peak (Figure 5D), a substantial (~80%) reduction in IrCP3 levels on SDS PAGE (Figure 5E), and the absence of IrCP3-associated DAB stained haem on the native gel (Figure 5F). These results collectively demonstrate that IrCP3 is the major haem-binding protein in I. ricinus haemolymph. Extracts from I. ricinus ovaries were colourless until the 3rd day after detachment (AD) from the host, and then the Soret peak absorbance gradually increased, indicating an increase in haem concentration up to 8 days AD (Figure 6A). SDS PAGE and Western blot analysis of ovary homogenates revealed that levels of IrVg1- and IrVg2-derived proteolytic products gradually increased after tick detachment whereas IrCP3 remained constant (Figure 6—figure supplement 1). Native pore-limit PAGE followed by DAB-based haem co-detection and Western blot analyses confirmed that the appearance of haem in tick ovaries was coincident with the occurrence of vitellins (Figure 6B). I. ricinus vitellogenin genes (ir-vg1 and ir-vg2) are exclusively expressed in fully engorged females, predominantly in the gut, salivary glands and trachea-fat body complex, but not in the ovaries (Figure 6—figure supplement 2). As vitellins are predominantly found in ovaries, their precursors (vitellogenins) must be transported from their site of synthesis to the ovaries. Vitellins are the major haem-binding proteins in tick ovaries. (A-B) Haem accumulation in tick ovaries occur concurrently with the appearance of vitellins. Ovaries were dissected from I. ricinus females at subsequent time-points after detachment (AD) from the host: FE - fully-engorged; 3 AD, 6 AD, 8 AD - 3, 6, and 8 days AD, respectively. (A) Absorbance spectra of ovaries homogenates show gradually increasing Soret peak following the 3rd day AD. (B) Native pore-limit PAGE of ovaries homogenates stained with Coomassie (CBB), co-detection of haem-associated peroxidase activity with 3,3´-diaminobenzidine (DAB), and Western blot analyses of vitellogenin 1- and vitellogenin 2- cleavage products (αIrVg1 and αIrVg2, respectively). Note that the native IrVg1- and IrVg2-specific bands correspond to the positions of the major haemoproteins in tick ovaries (red asterisks). (C-D) RNAi-mediated silencing of I. ricinus vitellogenin 1 and 2. Unfed I. ricinus females were pre-injected with gfp dsRNA (control, gfp), ir-vg1 dsRNA (ir-vg1 KD), and ir-vg2 dsRNA (ir-vg2 KD), allowed to feed naturally on guinea pigs and then re-injected after detachment from the host with the same amount of dsRNA. (C) Effect of I. ricinus vitellogenin 1 and 2 RNAi-mediated silencing on ovaries appearance and haem levels. Bottom panels show the detailed view of ovary parts depicted by the yellow dashed squares above. Levels of haem b were determined by HPLC in three independent homogenates of ovaries dissected from each tick group 6 days after detachment. (D) Native pore-limit PAGE of ovaries homogenates (10 μg protein per lane) dissected 6 days AD from control (gfp), ir-vg1 KD and ir-vg2 KD ticks. Gels were stained with Coomassie (CBB) for proteins, 3,3´-diaminobenzidine for peroxidase activity of haem (DAB, red asterisks), and Western blot analyses were performed with antibodies against vitellogenin 1 (αIrVg1) and vitellogenin 2 (αIrVg2). RNAi-mediated silencing of ir-vg1 and ir-vg2 resulted in a substantial decrease in mRNA levels of both vitellogenin genes in gut tissues, and the same dual silencing effect was also observed at the protein level for IrVg1 and IrVg2 in tick ovary homogenates (Figure 6—figure supplement 3). This result points to a mutual regulation of both genes by an as yet unknown mechanism. More importantly, silencing of both ir-vg1 and ir-vg2 led to impaired development of tick ovaries and concomitant reduction in haem content in this tissue (Figure 6C). 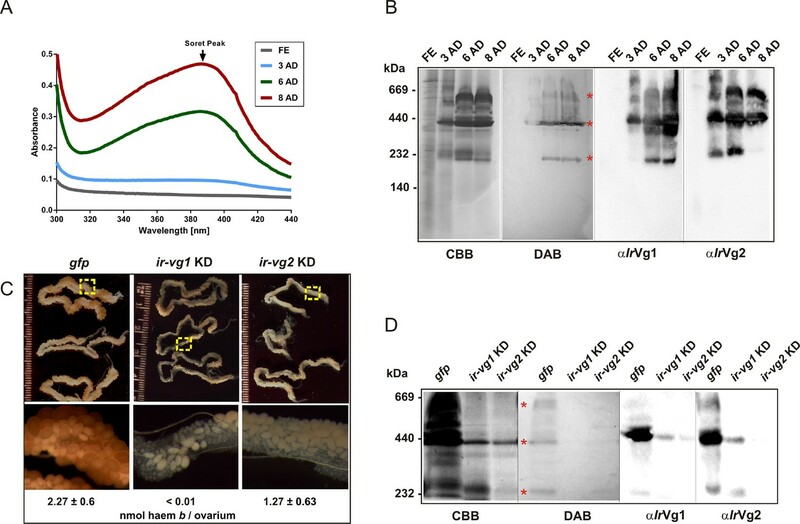 Additionally, native pore-limit PAGE followed by DAB-staining and Western blotting (Figure 6D) showed that decreased levels of both IrVg1 and IrVg2 in ovary homogenates from ir-vg1 and ir-vg2 KD ticks were associated with the disappearance of DAB-stained haem. These results collectively show that vitellins are the major haem-binding proteins in I. ricinus ovaries and imply that the majority of haem is transported, along with vitellogenins, to the developing oocytes after tick detachment from the host. The previous report on non-functional haem biosynthesis in the cattle tick R. microplus (Braz et al., 1999) prompted us to screen available mite genomes (namely: I. scapularis, T. urticae, and M. occidentalis) and reconstitute their gene repertoires for enzymes of the haem biosynthetic and degradative pathways. We found that 5-aminolevulinate synthase, together with the whole cytoplasmic segment of the haem biosynthetic pathway, is completely missing in hard ticks, but is present in other mites. Therefore we hypothesise that during evolution, ticks have lost most of the genes encoding haem biosynthesis as a consequence of their strict haematophagy. Only three genes encoding the vestigial mitochondrial enzymes of the haem biosynthetic pathway, namely PPOX, CPOX and FECH, have been retained in the I. scapularis genome (Gulia-Nuss et al., 2016) (Figure 1B) and their orthologues were also identified in midgut and salivary gland transcriptomes of I. ricinus (Kotsyfakis et al., 2015) (Figure 1—figure supplements 1–3). PPOX transcripts were also found in salivary gland transcriptomes from various species of the genus Amblyomma (Garcia et al., 2014; Karim and Ribeiro, 2015). The same partial reduction in genomic coding for haem biosynthesis has been reported for a unicellular parasite, Leishmania major, in which the intracellular amastigote form expresses an active PPOX that likely sequesters the haem precursor coproporphyrinogen III from the macrophage cytosol to complete synthesis of its endogenous haem (Zwerschke et al., 2014). Another haem auxotroph, the nematode Brugia malayi, was suggested to bypass its incomplete haem biosynthetic pathway using tetrapyrrole intermediates from endosymbionts (Wu et al., 2009). Two lines of evidence suggest that PPOX, CPOX and FECH are not involved in haem biosynthesis in adult ticks: (i) Earlier, it was reported for R. microplus that no radioactively labelled δ-aminolevulinic acid was incorporated into haem present in haemolymph and ovaries (Braz et al., 1999); (ii) Recently, we have shown that RNAi-mediated silencing of the terminal FECH did not exert any effect on tick engorgement, oviposition, and larval hatching (Hajdusek et al., 2016). This data suggests that these remnants of the haem biosynthetic pathway in I. ricinus do not contribute to the tissue haem pool that sustains successful reproduction. Therefore the reason for retaining genes encoding the last three enzymes of the haem biosynthetic pathway in ticks remains obscure and should undergo further investigation. The differential in vitro membrane feeding of I. ricinus females on whole blood (BF) or haemoglobin-free serum (SF) allowed us to investigate the importance of haemoglobin acquisition and inter-tissue transport of dietary haem in the hard tick I. ricinus, in an as yet unexplored way. These experiments surprisingly revealed that haemoglobin, which makes up about 70% of total blood proteins, is not a necessary source of amino acids for vitellogenesis (Figure 2 and Figure 3). Moreover, we have unambiguously demonstrated that haem in tick eggs originates entirely from host haemoglobin acquired during female feeding on hosts. Serum-fed I. ricinus were capable of full engorgement and oviposition, however embryonal development and larval hatching was aborted (Figure 2). The capability of tick embryos to develop viable progeny could be fully rescued by addition as little as about 1% of the physiological concentration of haemoglobin (0.1% in serum) (Figure 2—figure supplement 2). In contrast to ticks, serum-fed triatomine Rhodnius prolixus were capable of laying eggs and giving rise to viable larvae (Machado et al., 1998). As Triatominae insects possess a complete haem biosynthetic pathway (Kanehisa and Goto, 2000), they can apparently reproduce even in the absence of dietary haem. In the majority of animals studied so far (including insect blood-feeders), haem degradation represents the main source of iron, and conversely, iron is mainly utilised for de novo haem biosynthesis (Zhou et al., 2007; Gozzelino and Soares, 2014). Although it has been reported that, under certain conditions, haem can be degraded non-enzymatically (Atamna and Ginsburg, 1995), haem degradation-based on haem oxygenase (HO) is the most physiologically relevant (Khan and Quigley, 2011). We found that the HO gene was missing in the tick genome and correspondingly, the haem degradation product, biliverdin IX, could not be found in I. ricinus gut homogenates (Figure 3—figure supplement 3). We further noted that the absence of the HO gene is a common feature in other mite genomes (Figure 1B) and respective HO orthologues could not been found even in non-Acari genomes: the chelicerate genome of Stegodyphus mimosarum (Sanggaard et al., 2014) and the myriapode genome of Strigamia maritima (Chipman et al., 2014). The apparent absence of HO transcripts in two color-polymorphic spiders of the genus Theridion is in agreement with the notion that these animals do not produce bilin pigments as haem degradation products (Croucher et al., 2013). As HO gene is present in the genomes of Hexapoda (Adams et al., 2000; Holt et al., 2002) and Crustacea (Colbourne et al., 2011), we hypothesise that the loss of HO is an old ancestral trait of Chelicerata and Myriapoda that are phylogenetically supported as sister groups (Dunn et al., 2008). Such a finding raises the question of dietary iron source for these animals, since iron is an essential electron donor/acceptor involved in vitally important physiological processes such as energy metabolism, DNA replication, and oxygen transport (Hentze et al., 2004; Dunn et al., 2007). Earlier, we and others reported that successful tick development and reproduction is strictly dependent on the availability of iron and maintenance of its systemic homeostasis (Hajdusek et al., 2009; Galay et al., 2013). Here, we demonstrate that levels of intracellular ferritin, as an indicator of bioavailable iron, as well as the concentration of elemental iron, do not significantly differ in tick tissues dissected from BF and SF females (Figure 3C,D). These results further support the conclusion that bioavailable iron does not originate from haemoglobin-derived haem, but rather from serum iron-containing proteins, most likely host transferrin (Hajdusek et al., 2009; Galay et al., 2014; Mori et al., 2014). However, an unequivocal identification of the source(s) of bioavailable iron for tick metabolic demands has to await the implementation of a chemically defined artificial tick diet, as recently reported for the mosquito Aedes aegypti (Talyuli et al., 2015). The entire dependence of ticks on haem derived from host haemoglobin underscores the importance of a deeper understanding of haem inter-tissue transport from the site of haemoglobin digestion in the gut to ovaries and other peripheral tissues. In the triatomine bug, R. prolixus, a 15-kDa haemolymphatic haem-binding protein (RHBP) was reported to transport haem to pericardial cells for detoxification and to growing oocytes for yolk granules as a source of haem for embryo development (Walter-Nuno et al., 2013). The haem transport and/or binding in ticks is mediated by HeLp/CPs and vitellins (Maya-Monteiro et al., 2000; Logullo et al., 2002; Boldbaatar et al., 2010; Smith and Kaufman, 2014), that belong to the family of large lipid transfer proteins (LLTP) known to facilitate distribution of hydrophobic molecules across circulatory systems of vertebrates, as well as invertebrates (Smolenaars et al., 2007). Vitellogenins are reported to be expressed only in fertilised fully-fed females, whereas HeLp/CPs are expressed ubiquitously in various stages, including adult males, and tissues (Donohue et al., 2008; Donohue et al., 2009; Khalil et al., 2011; Smith and Kaufman, 2014). Based on these criteria, we clearly distinguished the I. ricinus carrier protein IrCP3 from two vitellogenins, IrVg1 and IrVg2 (Figure 5—figure supplement 1; Figure 6—figure supplement 2) and demonstrated that during tick feeding, most haem in haemolymph is bound to IrCP3. The haem is mainly transported to the developing ovaries during the off-host digestive phase, however the proportion of haem transported by IrCP3 or vitellogenins remains to be investigated. In ovaries, haem is sequestered by vitellins serving as haem-storage proteins for embryonal development. Further studies of the native arrangement and haem-binding capabilities of tick vitellins are needed to determine whether one or both vitellin apoproteins are involved in haem binding. Collectively, our results demonstrate that ticks lack functional haem biosynthesis, recycle dietary haem originating from digested haemoglobin, and the acquired haem does not contribute to the cellular iron pool. Therefore, haem and iron metabolism in ticks constitute a major departure from its canonical functioning described for other eukaryotic cells, where haem and iron homeostasis is based on balancing the flux between the opposing haem biosynthetic pathway and the HO-based degradative pathway. Further investigations of the exact molecular mechanisms involved in haem inter-tissue transport, intracellular trafficking, and compartmentation within the tick digest cells, promise to identify vulnerable targets in tick haem auxotrophy. This may lead to novel strategies for controlling ticks and the diseases that they transmit. A pathogen-free colony of Ixodes ricinus was kept at 24°C and 95% humidity under a15:9-hr day/night regime. Twenty five females and males were placed into a rubber ring glued on the shaven back of guinea pigs and ticks were allowed to feed naturally for a specified time or until full engorgement (7‒9 days). Partially or fully engorged ticks were then either dissected or kept separately in glass vials until oviposition and larval hatching. All laboratory animals were treated in accordance with the Animal Protection Law of the Czech Republic No. 246/1992 Sb., ethics approval No. 095/2012. Membrane feeding of ticks in vitro was performed in feeding units manufactured according to the procedure developed by Kröber and Guerin (Kröber and Guerin, 2007). Whole bovine blood was collected in a local slaughter house, manually defibrinated and supplemented immediately with sterile glucose (0.2% w/vol). To obtain serum, whole blood samples were centrifuged at 2 500 × g, for 10 min at 4°C and the resulting supernatant was collected and centrifuged again at 10 000 × g, for 10 min at 4°C. Diets were then supplemented with 1 mM adenosine triphosphate (ATP) and gentamicin (5 µg/ml), pipetted into the feeding units and regularly exchanged at intervals of 12 hr. For feeding, fifteen females were placed in the feeding unit lined with a thin (80‒120 μm) silicone membrane, previously pre-treated with a bovine hair extract in dichloromethane (0.5 mg of low volatile lipids) as described (Kröber and Guerin, 2007). After 24 hr, unattached or dead females were removed and an equal number of males were added to the remaining attached females. For rescue experiments, pure bovine haemoglobin (Sigma, St. Louis, MO, H2500) was added to the serum diet since the 5th day of feeding at a concentration of 10%, 1%, or 0.1% (w/vol) and then feeding was resumed until tick full engorgement. Naturally or in vitro fed I. ricinus females were forcibly removed from the guinea pig or membrane at a specified time of feeding, or collected at a specified time after detachment. Haemolymph was collected into a glass capillary from the cut front leg, pooled, and used for subsequent experiments. Other tissues, namely ovaries, salivary glands, gut, tracheae with adjacent fat body cells, Malpighian tubules, and the remaining tissues tagged as ‘rest’ were dissected on a paraplast-filled Petri dish under a drop of DEPC-treated PBS. Total RNA was isolated from dissected tissues using a NucleoSpinRNA II kit (Macherey-Nagel, Germany) and stored at –80°C prior to cDNA synthesis. Total RNA from haemolymph was isolated using TRI reagent (Sigma). Single-stranded cDNA was reverse-transcribed from 0.5 µg of total RNA using the Transcriptor High-Fidelity cDNA Synthesis Kit (Roche Diagnostics, Germany). For subsequent applications, cDNA was diluted 20 times in nuclease-free water. The search for tick genes encoding enzymes possibly involved in the haem biosynthetic and haem degradative pathways, a BLAST search using mosquito (Anopheles gambiae) genes was performed in the genome-wide database of Ixodes scapularis (https://www.vectorbase.org/organisms/ixodes-scapularis). Genes encoding canonical haemoproteins were identified based on their genomic annotation. Other mite genomes, namely T. urticae (Grbić et al., 2011) and M. occidentalis, were mined in available databases http://metazoa.ensembl.org/Tetranychus_urticae/Info/Index/ and http://www.ncbi.nlm.nih.gov/bioproject/62309, respectively. Additionally, transcriptomes available at the National Center for Biotechnology Information (http://www.ncbi.nlm.nih.gov) were screened using the BLAST® program. Metabolic pathways were reconstituted according to the Kyoto Encyclopedia of Genes and Genomes (Kanehisa and Goto, 2000). Gene products of 1806 bp, 2070 bp, 2151 bp, and 519 bp encoding fragments of I. ricinus carrier protein CP3 (ir-cp3), I. ricinus vitellogenin 1 (ir-vg1), vitellogenin 2 (ir-vg1), and complete ferritin 1 (ir-fer1), respectively, were amplified from a whole body cDNA library using primers designed according to corresponding I. scapularis orthologues or the ir-fer1 sequence (for primer sequences, see Supplementary file 3). Resulting amplicons were purified using the Gel and PCR Clean-up kit (Macherey-Nagel), cloned into the pET100/D-TOPO vector of Champion pET directional TOPO expression kit (Invitrogen, Carlsbad, CA), and expressed using E. coli BL 21 Star (DE3) chemically competent cells. Expressed fusion proteins were purified from isolated inclusion bodies in the presence of 8M urea using a 5 ml HiTrap IMAC FF (GE Healthcare Bio-Sciences AB, Sweden) metal-chelating column charged with Co2+ - ions and eluted with an imidazole gradient. The recombinant proteins (for sequences, see Supplementary file 2) were refolded by gradually decreasing the concentration of urea, finally dialyzed against 150 mM Tris/HCl, 150 mM NaCl, pH = 9.0, and used to immunize rabbits as described previously (Grunclová et al., 2006). The immune sera against IrCP3, IrVg1, IrVg2 and IrFer1, tagged as αIrCP3, αIrVg1, αIrVg2 and αIrFer1, were collected, aliquoted, and stored at –20°C until use. cDNA preparations from developmental stages and tissues were made in independent triplicates and served as templates for the following quantitative expression analyses by quantitative real-time PCR (qPCR). Samples were analysed using a LightCycler 480 (Roche) and Fast Start Universal SYBR Green Master Kit (Roche). Each primer pair (for the list of qPCR primers, see Supplementary file 3) was inspected for its specificity using melting curve analysis. Relative expressions of ir-cp3, ir-vg1 and ir-vg2 were calculated using the ΔΔCt method (Pfaffl, 2001). The expression profiles from adult I. ricinus female tick tissues were normalized to actin and the developmental stage expression profiles were normalized to elongation factor 1 (ef1) (Nijhof et al., 2009; Urbanová et al., 2014). A 521-bp fragment of ir-cp3 (corresponding to positions 2688–3208 bp, GenBank KP663716), a 301-bp fragment of ir-vg1 (corresponding to positions 2277–2577 bp of I. scapularis orthologue ISCW013727), a 303-bp fragment of ir-vg2 (corresponding to positions 801–1103 bp of I. scapularis orthologue ISCW021228) were amplified from tick gut cDNA and cloned into the pll10 vector with two T7 promoters in reverse orientations (Levashina et al., 2001), using primer pairs CP3-F_RNAi, CP3-R_RNAi (Supplementary file 3) containing the additional restriction sites ApaI and XbaI. dsRNA of ir-fer1 and ir-irp were synthesized as described (Hajdusek et al., 2009). Purified linear plasmids served as templates for RNA synthesis using the MEGAscript T7 transcription kit (Ambion, Lithuania). dsRNA (~1 µg in 350 nl) was injected into the haemocoel of unfed female ticks using Nanoinject II (Drummond Scientific Company, Broomall, PA). Control ticks were injected with the same volume of gfp dsRNA synthesized under the same conditions from linearized plasmid pll6 (Levashina et al., 2001). After 24 hr of rest in a humid chamber at room temperature, ticks were allowed to feed naturally on guinea pigs. The gene silencing was verified by qPCR and/or Western blot analyses. Tissue homogenates were prepared in 1% Triton X-100 in PBS supplemented with a CompleteTM cocktail of protease inhibitors (Roche) using a 29G syringe, and subsequently subjected to three freeze/thaw cycles using liquid nitrogen. Proteins were then extracted for 1 hr at 4°C and 1 200 rpm using a Thermomixer comfort (Eppendorf, Germany). Samples were then centrifuged 15 000 × g, for 10 min at 4°C. Protein concentrations were determined using the Bradford assay (Bradford, 1976). Electrophoretic samples for SDS-PAGE were prepared in reducing Laemmli buffer supplemented with β-mercaptoethanol. Ten micrograms of protein were applied per lane unless otherwise specified. Proteins were separated on gradient (4–15%) Criterion TGX Stain-Free Precast gels (BioRad, Hercules, CA) in Tris-Glycine-SDS running buffer (25 mM Tris, 192 mM glycine, 0.1% (w/vol) SDS, pH 8.3) and visualized using TGX stain-free chemistry (BioRad). Proteins were transferred onto nitrocellulose using a Trans-Blot Turbo system (BioRad). 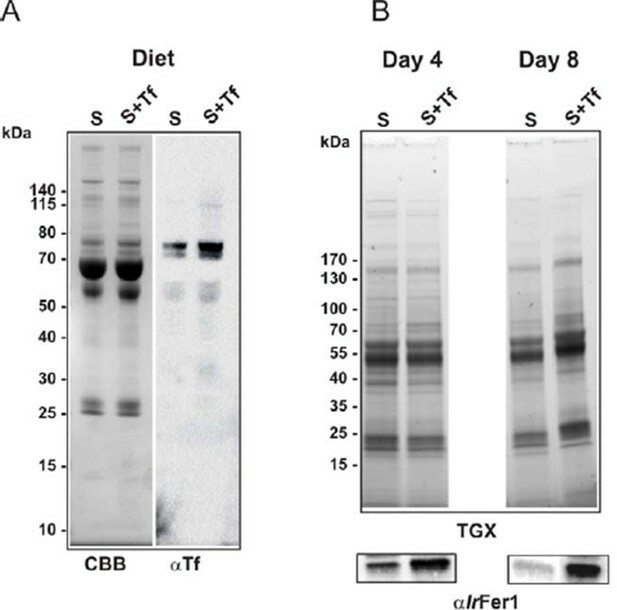 For Western blot analyses, membranes were blocked in 3% (w/vol) non-fat skimmed milk in PBS with 0.05% Tween 20 (PBS-T), incubated in immune serum diluted in PBS-T (αIrFer1-1:50, αIrVg1-1:1 000, αIrVg2-1:1 000, αIrCP3-1:1 000), and then in the goat anti-rabbit IgG-peroxidase antibody (Sigma) diluted in PBS-T (1:50 000). Signals were detected using ClarityWestern ECL substrate, visualized using a ChemiDoc MP imager, and analysed using Image Lab Software (BioRad). Normalisation of Western blot analyses of gut homogenates were conducted using antibodies against IrCP3, and homogenates of ovaries and eggs were normalised against the whole lane protein profile. Membrane stripping was carried out in a solution of 2% (w/vol) SDS and 0.5% (vol/vol) β-mercaptoethanol, and membranes were incubated for 1 hr at room temperature. Tissue homogenates were prepared as described above in Tris-Borate-EDTA (TBE) buffer (0.09M Tris, 0.08M boric acid, 2mM EDTA) supplemented with a CompleteTM protease inhibitor cocktail (Roche). Electrophoretic samples for pore-limit native PAGE were supplemented with 10% (vol/vol) glycerol and 0.001% (w/vol) bromophenol blue. Samples were run in 4‒16% Bis-Tris gel (Invitrogen) at 150 V in a cold room for 12 hr. Proteins were stained with Coomassie Brilliant Blue R-250 (CBB). For visualisation of haem-associated peroxidase activity, the gel was rinsed in water and then incubated in 100 mM sodium acetate pH 5.0 with 0.2% (w/vol) 3,3’-diaminobenzidine (DAB) and 0.05% (vol/vol) hydrogen peroxide (McDonnel and Staehelin, 1981). Alternatively, proteins were transferred onto nitrocellulose using a Trans-Blot Turbo system (BioRad) and used for Western blot analyses as described above. Homogenates of five ovaries were prepared as described above in 400 μl TBE buffer and briefly spun down. Haemolymph samples were diluted 1:4 in TBE. Collected faeces (10 mg) were homogenised in 100 µl of TBE buffer and briefly spun down. Supernatants from all samples were applied in a 2 μl-drop on a NanoQuant Plate (Tecan, Austria) and absorbance over the UV-VIS spectrum was scanned using the model Infinity 200 M Pro microplate reader (Tecan). One dissected ovary, or 10 mg of eggs, was manually homogenised in methanol / 0.2% NH4OH (vol/vol) and centrifuged (15 000 × g, 10 min). The supernatant was discarded and haem was extracted from the pellet in 80% acetone / 2% HCl (vol/vol). The extract was immediately separated by HPLC on a Nova-Pak C18 column (4-μm particle size, 3.9 × 75 mm; Waters, Milford, MA) using a linear gradient of 25–100% (vol/vol) acetonitrile/0.1% trifluoroacetic acid at a flow rate of 1.0 ml/min at 40°C. Haem b was detected by a diode array detector (Agilent 1200; Agilent Technologies, Santa Clara, CA) and quantified using an authentic haemin standard (Sigma, H9039). Tick guts (wet weight ~20 mg) were dissected from naturally fed ticks 5 days after detachment from the guinea pig and homogenized individually in 100 µl of sterile PBS. For a positive control, 13 Aedes aegypti females were allowed to feed on mice and homogenized the 3rd day after feeding in 200 µl of sterile PBS. The samples were centrifuged (15, 000 × g, 10 min), supernatants were extracted in 80% acetone / 2% HCl (vol/vol) and separated by HPLC on a Zorbax Eclipse plus C18 column (3.5 µm particle size 4.6 x 100 mm, Agilent). A linear gradient (0–100%, 20 min) of solvent A (methanol: acetonitrile: 0.01 M sodium acetate pH 3.65; 1:1:2) and solvent B (acetonitrile / 0.1% TFA) at a flow rate of 0.6 ml/min at 40°C was used. Biliverdin IX and haem b were detected simultaneously using an Agilent 1200 diode array detector at wavelengths of 660 nm and 375 nm, respectively. I. ricinus females were membrane fed on a blood or serum diet for 7 days until partial engorgement. Ovaries and salivary glands were dissected, taking special care to avoid contamination with gut contents, and washed in ultrapure 150 mM NaCl (TraceSELECT, Fluka, Switzerland). Pools of tissues, collected from 5 females, were spun down briefly to remove excess saline, and freeze-dried. The dry tissue samples were weighed on microbalances (with microgram precision) and submitted for elemental analysis using graphite furnace atomic absorption spectroscopy, kindly performed by Prof. Hendrik Küpper, Institute of Plant Molecular Biology, BC CAS, České Budějovice. The iron concentrations obtained were expressed in parts per million (ppm) related to the dry weight of tissues. Data were analysed by GraphPad Prism 6 for Windows, version 6.04 and an unpaired Student’s t-test was used for evaluation of statistical significance. Journal of Biological Chemistry 270:24876–24883. Journal of Insect Physiology 56:1587–1598. Journal of Insect Physiology 55:287–296. Trends in Cell Biology 17:93–100. The Tohoku Journal of Experimental Medicine 213:1–16. Journal of Experimental Biology 216:1905–1915. Antioxidants & Redox Signaling 20:1754–1769. Insect Biochemistry and Molecular Biology 36:322–335. Proceedings of the National Academy of Sciences of the United States of America 106:1033–1038. Ticks and Tick-Borne Diseases, 10.1016/j.ttbdis.2016.01.006. Biochimica Et Biophysica Acta (BBA) - Molecular Cell Research 1823:1617–1632. Insect Biochemistry and Molecular Biology 27:639–649. Journal of Insect Physiology 57:400–408. Biochimica Et Biophysica Acta (BBA) - Molecular Cell Research 1813:668–682. European Journal of Clinical Investigation 34:619–625. Insect Biochemistry and Molecular Biology 33:103–113. Evolution of the haem synthetic pathway in kinetoplastid flagellates: An essential pathway that is not essential after all? International Journal for Parasitology 40:149–156. Journal of Experimental Biology 206:1707–1715. Journal of Experimental Biology 208:3093–3101. Insect Biochemistry and Molecular Biology 32:1805–1811. Archives of Insect Biochemistry and Physiology 39:133–143. Journal of Biological Chemistry 275:36584–36589. Ticks and Tick-Borne Diseases 5:121–126. Molecular and Biochemical Parasitology 111:217–221. Proceedings of the National Academy of Sciences of the United States of America 103:8030–8035. Proceedings of the National Academy of Sciences of the United States of America 102:4270–4275. Free Radical Biology and Medicine 28:289–309. Ticks and Tick-Borne Diseases 5:821–833. The Journal of Lipid Research 48:489–502. Journal of Insect Physiology 83:1–7. Developmental & Comparative Immunology 46:439–447. Journal of Biological Chemistry 288:29323–29332. PLoS Neglected Tropical Diseases 3:e475. Journal of Insect Physiology 53:1169–1178. Thank you for choosing to send your work entitled "Haem Acquisition and Distribution in Ticks" for consideration at eLife. Your full submission has been evaluated by Detlef Weigel (Senior editor) and three peer reviewers, one of whom is a guest of our Board of Reviewing Editors. The decision was reached after discussions between the reviewers. Based on our discussions and the individual reviews below, we regret to inform you that your work will not be considered further for publication in eLife. While one cannot fail to recognize the large amount of time and effort that went into the work and reviewers appreciate attention to an important topic, a number of substantial concerns were raised. The major and unanimous consensus is that the study, as it currently stands, is premature and that a substantial series of additional experiments will be required to draw meaningful conclusions from the key questions. In particular, experiments concerning the dependency of larval viability solely on haem and non-utilization of haemoglobin haem as a source of iron, as well as roles and relationship of carrier protein and vitellogenin in haem transport or other aspects of tick physiology, require additional critical controls and more careful interpretation of the data. While the I. scapularis genome is incompletely annotated and data mining efforts possibly require careful extraction and analyses of trace files, there seems to be a missed opportunity in appropriate mapping of the orthologs in the haem biosynthetic pathway. The incomplete bioinformatics analyses thus precluded the formulation of tangible hypotheses, particularly one concerning the evolution of haem auxotrophy in ticks. Finally, the manuscript also needs improvement in textual organization, including with necessary details of certain result and methodological sections. Specific comments from the reviewers are appended below. The haem biosynthetic pathway remains highly conserved across metazoan evolution, although certain eukaryotes, including cattle ticks, were shown to be haem auxotrophs. The current manuscript by Perner et al. extends these observations by identifying haem auxotrophy in another major tick vector, Ixodes spp., that transmits a number of human infections. The approaches are ingenious, and the manuscript contains much important information regarding haem and iron homeostasis in an important disease vector. However, much of the data could be improved upon to present more compelling evidence to support the authors' major conclusions, which are noted below. 1) Paragraph one, subheading “Host blood haemoglobin is expendable for tick feeding and oviposition but essential for reproduction”, Figure 2: What is truly interesting about this work is that haem seems to play a critical role in tick reproductive physiology. This speculation is derived from the key finding that unlike with blood, ticks fed on serum are unable to give rise to larvae. However, serum-fed ticks are not only deprived of hemoglobin from RBCs but also lack many other cellular/molecular components present in the blood. If haem is indeed the blood factor (absent in serum-fed ticks) that resulted in reproduction defects, then the authors could restore these defects with biochemical complementation by adding physiological concentrations of haem (or hemoglobin) to the serum used for tick feeding. This is a critical experiment that needs to be performed to support the authors' major conclusion. 2) Paragraph one, subheading “Haemoglobin is an indispensable source of haem, replaceable source of amino acids, and not a source of iron for ticks”, Figure 3: The proposition that haemoglobin is not a source of iron for ticks is another novel aspect of the study. However, the conclusion is based on indirect evidence that needs to be further substantiated. Iron concentration could be measured in tick tissues. The authors need to show that the amount of non-haem (serum) iron in blood-fed ticks is comparable to that of the total iron in serum-fed ticks. 3) The Method/Results section relevant to the in vitro membrane feeding system is severely deficient in details that would permit other labs to reproduce the work. The authors should mention the differences (in any) in feeding time, engorgement rates, percentage of egg-laying females in comparing blood with serum feeding. This would suggest how serum feeding impacts tick engorgement, growth, and embryogenesis. 4) The defect in larval hatching for serum-fed ticks is an interesting finding that also lack details and should be elaborated further. No evidence is provided other than an undefined image (Figure 2, bottom right panel) and a statement "[…]whereas no larvae hatched out of SF ticks' eggs". If these represent immature eggs, at least a thorough histological analysis would be useful. 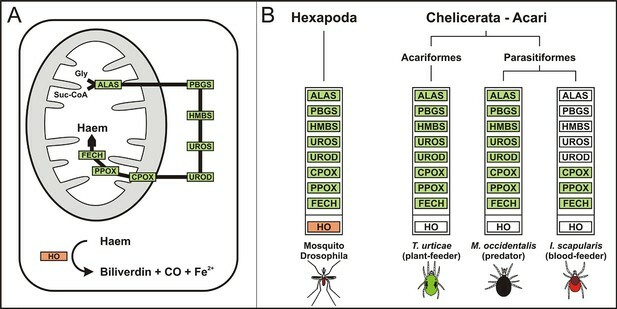 The main conclusions the authors draw are that 1) the tick I. ricinus is an obligate heme auxotroph and relies on hemoglobin from blood meals as a heme source; 2) Hemoglobin heme is not utilized as an iron source; 3) CP3 (HeLP) is the main hemoprotein in the hemolymph while vitellins bind heme in the ovaries. While the reliance on the hematocrit for larval viability is clear, it is not shown that this is specifically due to heme. While Hb heme may not be the preferred source of free-iron under normal conditions, mechanisms may exist to utilize heme as an iron source when iron becomes limiting. Finally, the requirement for CP3, Vg1, and Vg2 for inter-tissue heme transport or heme-dependent viability is poorly demonstrated, and maybe this is due to a lack of tractability of the tick model. In summary, new data are essential to support the major conclusions in this manuscript. 1) While the authors show that blood cells are required for larval viability, it is not conclusively shown that this is heme-dependent. Exogenous heme can easily be added back into serum to establish whether hatching of progeny can be rescued, showing this phenotype is specifically due to a lack of heme and not due to another components of the hematocrit. Additionally, the efficiency of ferrochelatase knockdown is not shown. Protoporphyrin IX and iron can be added back to the serum to analyze whether the ferrochelatase is truly functional and lysates can be directly analyzed for FECH activity. 2) Genomic analyses and measuring ferritin levels is not sufficient to say the tick has no mechanism for removing iron from heme. There are examples of non-canonical heme oxygenases, for example in bacteria. To more definitively show that heme can utilized as an iron source, iron and heme-free serum should be supplemented with iron, heme, or both and then measurements of non-heme vs heme iron be performed in various tissues. Since HPLC data are already shown for heme levels, a direct measurement of heme degradation products / biliverdin can be made by HPLC. Changes in Ferritin levels are not a great indicator of iron levels, as mammalian Ftns are also acute phase proteins. Is Fer1/2 regulated by stress as by heme starvation? 3) The functional relationship between the homologs CP3, Vg1 and Vg2 is unclear. It is postulated that CP3 is the main heme carrier protein in the hemolymph but the reduction in heme content in eggs is minimal when CP3 is knocked-down, and it is not shown whether viable larvae arise from these eggs. If developing embryos are completely reliant on maternally-derived heme, there must be another mechanism for maternal heme delivery to ovaries. Does the ricinus genome code for additional CPs like scapulus? Additionally, if Vg1 and Vg2 bind heme after heme deposition in the ovaries, why would knockdown result in reduced heme in this tissue? What happens to intestinal heme content when CP3, Vg1 and Vg2 are knocked down? One might expect heme accumulation in the intestine or hemolymph if a heme carrier is depleted, depending on which tissue the carrier protein acquires heme. The paper "Haem Acquisition and Distribution in Ticks" by Perner et al. describes and functionally dissects heme metabolic pathway in tick Ixoides scapularis and I. ricinus using combination of genomic analysis and manipulative experiments. 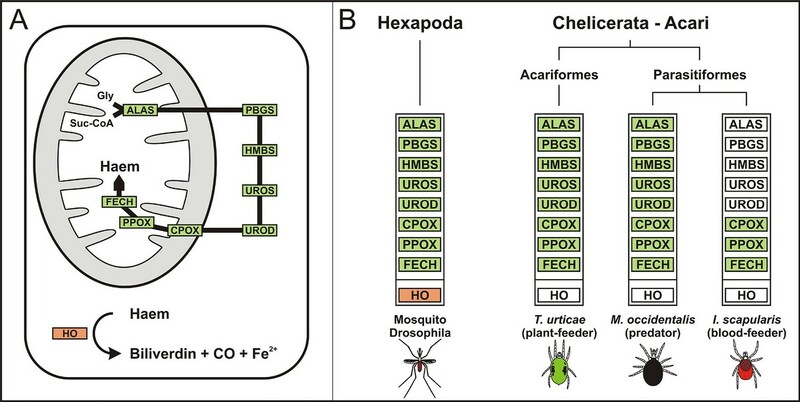 Authors develop an evolutionary scenario explaining heme metabolism that would support changes in I. scapularis and I. ricinus genome reflecting gene loss in heme synthesis and heme catabolism pathway. Although manipulative experiments are elaborate and describe the transport of heme to the eggs, evolutionary scenario suffers from incompleteness. First, it is known that the genome of Ixoides scapularis is not completely finished and is not annotated at the level representing the standard in the field. Thus, 3 out of six genes claimed to be absent appear to be present in I. scapularis genome. Having in mind that all of listed genes were incompletely predicted and supported by few RNAseq (please compare T. urticae homologs) it cannot be excluded that the remaining 3 genes are present but in the portion of I. scapularis genome that has not been completed or not well annotated. This should provide just a guidance and authors should confirm all these cases by proper alignment etc. Also authors propose the scenario that loss of heme oxygenase represents specific feature of ticks as adaptation on heme-rich diet: "Therefore, we speculate that lack of haem oxygenase in ticks presents another unique feature of their adaptation to the haem-rich diet. This constitutes a major departure from the canonical functioning of haem and iron metabolism described for other eukaryotic cells, where haem and iron homeostasis is based on balancing flux between the opposing haem synthesis pathway and the haem oxygenase degradation pathway. Authors conclude that "The lack of haem catabolism given the absence of haem oxygenase apparently presents another unique feature of tick adaptation to the haem-rich diet." The quick analysis of T. urticae genome shows that this species also lack heme oxygenase. This species is plant-feeding and not exposed to heme-rich diet. Thus proposed evolutionary scenario is not sustainable. Possibility that it is simply missed in T. urticae is excluded by absence of it in related unpublished spider mite genomes. Thus, an additional analysis and re-interpretation of data is necessary to support major conclusions of this paper. The newly resubmitted manuscript addressed a number of important issues brought up during the original review. While all reviewers agreed that there is a substantial improvement in the quality of the data and their presentation, and that this is a fascinating study, a number of substantial concerns were raised, most of which require major editorial revision of the manuscript. Specific comments from the reviewers that require your attention are appended below. 1) Data presented in Figure 2 suggest critical involvement of hemoglobin in tick development. As the manuscript discuss heme auxotrophy, please clarify why reconstitution experiments involved supplementation of hemoglobin, rather than heme, to the SF media. Also clarify whether there is a correlation between numbers of live/hatched progeny with heme concentration. This is important because low heme may support hatching of larvae in the initial stages but may not be able to keep up as embryos utilize the limited supply of heme, as demonstrated by a previous article by Walter-Nuno et al., JBC 2013. 2) Perhaps the most interesting discovery here is that hemoglobin is required for embryo viability without serving as an iron or as an amino acid source. Then why is Hb required? Some additional experimentation could be conducted with their in vitro membrane feeding system, for example, adding other globular proteins or myoglobin to determine more specifically why Hb is required. 3) The proper way to determine whether a heme degradation system exists is to first deplete all sources of inorganic iron followed by supplementation of varying concentrations of heme as the sole iron source (Figure 3). Under these conditions, it is possible that ticks may be able to degrade heme to acquire iron. This result will indicate that heme degradation is conditional and induced when iron is limiting and that a non-canonical enzyme might be performing this function (as is found in several bacteria). Please clarify and discuss these possibilities. 4) The AAS result does not distinguish whether the iron was derived from Hb or other serum components (such as Tf). The result in Figure 3D is just suggestive, because SF conditions have the same iron and BF. Again, the only way to demonstrate this is to remove all sources of heme and inorganic iron followed by titrating heme and/or iron back. 5) Please clarify this statement "an efficient inter-tissue heme distribution system", when only 100 nmol of heme is being utilized from a blood meal to be transported to the ovaries. What was the method used to measure this? 6) The authors should discuss why the ticks have retained the last three enzymes in heme biosynthesis – could these enzymes serve another function? Could heme precursors from the host enter into this partial pathway? What is their expression over the course of tick feeding and development? Please refer to whether any of these genes (transcripts) were identified in published studies (especially recent RNA-Seq studies) involving Ixodes ticks. 7) The authors should provide some possibilities for where egg Fe is coming from if not Hb. They suggest other serum proteins such as transferrin. Could they test this by manipulating transferrin content in their in vitro assay? 8) The hypothesis stating that hemoglobin and serum proteins are endocytosed within gut cells via distinct mechanisms is not supported by solid experimental data, so please modify the statement. 9) Please clarify the statement "These results collectively show that vitellins are the major haemoproteins". Does vitellin actually function with heme bound, or is it a storage molecule for heme? 10) The authors say "these experiments revealed that haemoglobin was, surprisingly, not strictly required as a source of amino acids for vitellogenesis (Figure 2 and Figure 3)." Please clarify why this is surprising. Finally, the discussion needs to be more cohesive and better link various results on tick metabolism and development into one complete story. While one cannot fail to recognize the large amount of time and effort that went into the work and reviewers appreciate attention to an important topic, a number of substantial concerns were raised. […] Specific comments from the reviewers are appended below. Summary of the major changes, new data, and additional experiments carried out to improve the merit of our work presented in the new manuscript. In addition to the tick Ixodes scapularis genome, the genome-wide search has been performed in available genomes of other related mites namely the herbivorous mite Tetranychus urticae and the predatory mite Metaseiulus occidentalis. This mining, completed by a detailed phylogenetic analysis, confirmed that while non-hematophagous mites contain all genes coding for complete haem biosynthesis, the I. scapularis genome has retained only three genes encoding vestigial mitochondrial enzymes of haem biosynthesis, namely coproporphyrinogen-III oxidase (CPOX), protoporphyrinogen oxidase (PPOX) and ferrochelatase (FECH). Two other genes present in I. scapularis genome: δ- aminolevulinic acid synthase (ALAS) and uroporphyrinogen decarboxylase (UROD) are clearly of bacterial origin. Another new discovery made by the genome wide searches was that gene coding for haem oxygenase is commonly missing also in other mites and possibly in chelicerates and myriapodes in general. Therefore, we conclude that lack of haem oxygenase in ticks is not likely an evolutionary adaptation to the blood-feeding but rather an old ancestral trait of the last common ancestor of Chelicerata and Myriapoda. In-vitro membrane feeding of I. ricinus females was complemented by a rescue experiment performed by addition of different concentration of commercial bovine haemoglobin to the serum diet. This conclusively confirmed that dietary haemoglobin is essential as a source of haem for embryonic development and tick reproduction. Full rescue of fertility is obtained with less than 1% of the physiological concentration of hemoglobin in blood.Under this condition, where haemoglobin contribution as an amino acid source is negligible, a significant amount of haem is still transferred to the eggs allowing normal embryo development. The embryonic development in tick eggs was examined by microscopy and the results are included in relevant figures. The analysis of elemental iron in tick peripheral tisssues was performed by a highly sensitive method of graphite-furnace atomic absorption spectroscopy (GF AAS) that allows determination of elemental iron concentration in a sub-milligram range of starting biological material (as is the case of pooled and dried tick tissues). Since GF AAS cannot distinguish between haem and non-haem iron, only ovaries and salivary glands dissected from partially engorged BF or SF ticks were analysed. The obtained results confirmed the previous data based on quantitative monitoring of ferritin 1 levels in tick tissues proving that haem is not a source of bioavailable iron for ticks. In order to provide a stronger evidence that haem is not catabolised in ticks, we have adapted an HPLC method for detection of biliverdin IX in the tick gut homogenates. This analysis confirmed that no haem degradation product was present in the guts of fully engorged ticks, while we could detect biglutaminyl-biliverdin IX metabolite in homogenates from blood-fed mosquitoes, used as a positive control. Data showing that RNAi-silencing of ferrochelatase had no effect on tick feeding success, oviposition, and reproduction, raised another questions about its physiological role, that we were not able to answer. As we felt that these data were contributing to a loss of focus on the main conclusions of this work, we used them in another manuscript with a distinct focus(Hajdusek et al. “Tick iron and heme metabolism -- new target for an anti-tick intervention”, currently under revision). We refer to these results in the Discussion with a tentative reference as (Hajdusek et al., submitted manuscript). 6) The manuscript was largely re-written to improve the overall readability, figures re-arranged to include new data, and the obtained results accordingly re-interpreted. We agree with the reviewer that the lack of experiment with addition of haem or haemoglobin into the serum diet to rescue tick reproduction was a critical drawback. We performed this experiment with addition of physiological concentration (10%) of pure bovine haemoglobin and demonstrated that the embryonic development and larvae hatching was fully restored (see bottom panels of Figure 2). In addition, we performed this experiment with sub-physiological concentrations of haemoglobin (1% and 0.1%) and could demonstrate that as little as about one hundredth of haemoglobin levels in tick diet is sufficient to sustain their reproduction. We agree with the reviewer that supplementation the serum with haem (haemin) would be interesting. However, such an experiment requires a demanding optimization because of haem binding capacity of serum proteins (e.g. haemopexin, albumin). Therefore simple addition of haemin into serum may lead to artefactual results which would be difficult to interpret. We agree with the reviewer that the proof of bio-available iron content based on monitoring intracellular ferritin (Fer1) in tissues (such as used in our previous work, Hajdusek et al., PNAS, 2009) is indirect and requires substantiation. Therefore, we performed a determination of total elemental iron in tick tissues by GF AAS (see above, paragraph 3). This analysis confirmed that, apart from bioavailable iron, there is also no significant difference in levels of elemental iron in tissues from BF and SF ticks (Figure 3D). There were no obvious differences in the time-course of membrane feeding, feeding success, weights of engorged females and egg clutches sizes between BF and SF ticks. These experiments were repeated many times with reproducible results (see Author response image 1 below). Table 1: Overview of the feeding and egg laying parameters of membrane-fed I. ricinus females. We agree that our previous statement that “no larvae hatched out of eggs laid by SF ticks” was insufficient as a proof of impaired tick reproduction. Therefore, we performed a light microscopic examination of developing embryos in eggs laid by BF- and SF- ticks, as well as in the rescue experiment with different amount of haemoglobin in the serum diet (S+Hb ticks). We noted that embryonic development was blocked only in eggs from SF ticks (see Figure 2 and Figure 2—figure supplement 2). We appreciate the ideas of the reviewer how to proof the lack of haem biosynthesis in ticks. However, addition of just soluble haemin or haem precursor into the diet is a kind of oversimplification that does not take in account the complexity of tick digestive system. Haem is released from digested haemoglobin inside the digestive vesicles of the tick gut digest cells after its receptor-mediated endocytosis involving clathrin-coated pits. Therefore we used for the rescue experiment the pure commercial haemoglobin to demonstrate that haemoglobin alone (together with other serum components) and no other component of the red blood cells is required for successful tick reproduction. The consequence ‘no haemoglobin in the diet – no haem in eggs – no embryonic development’ is to our opinion a strong evidence that haem needed for tick reproduction originates exclusively from the host haemoglobin. Certainly, we cannot completely rule out that haem might be provided from other resources during the whole developmental cycle of the hard ticks, especially during the long inter-stage periods of starvation. In the previous manuscript, the efficiency of ferrochelatase knockdown by RNAi was shown in the Figure 1—figure supplement 1, panel D. The information that ferrochelatase RNAi had no obvious effect on tick fecundity was included among screening of other genes/proteins possibly playing a role in tick haem and iron metabolism and was recently submitted to another journal. As mentioned above, this part was completely removed from the current version of the manuscript and we only refer to this result in the Discussion to support the conclusion that the retained haem biosynthetic genes do not play a role in the synthesis of endogenous haem in adult ticks. We agree with the reviewer that determination of bio-available iron by monitoring levels of intracellular ferritin 1 is only indirect proof of the lack of haem catabolism in ticks. Therefore, we performed additional experiments based on determination of elemental iron in tick tissues by GF-AAS (see above the paragraph 3 and response to the Reviewer #1, Major concern 2). Obtained results confirmed that iron levels in tick tissues are independent on the haemoglobin presence in tick diet. Additional HPLC analysis of tick gut extract (see the paragraph 4 above) confirmed the absence haem- derived biliverdin in line with our previous hypothesis that lack of haem oxygenase in ticks is associated with the need to obtain iron from serum components and not from haem. We agree with the reviewer that the relation between the haem-binding lipoproteins might seem unclear. In order to distinguish these two groups of lipoproteins, the knowledge of their stage and tissue expression profiles is needed. RNAi-mediated silencing of IrCP3 led to about 80% reduction of IrCP3 in tick haemolymph and only to about 50% reduction of haem in laid eggs. This can be explained either by the incomplete depletion of IrCP3 from tick haemolymph in KD ticks or by contribution of other CPs homologues possibly present in I. ricinus haemolymph. Alternatively, the haem transporting role is taken over by vitellogenins which presence in ovaries coincides with appearance of haem. Since we are aware about the uncertainty behind the haem inter-tissue transport in ticks, we interpret our obtained results in a more careful way and leave the ultimate answers to our future research. Here, we present only the unambiguous results: IrCP3 is the main haem-binding protein in I. ricinus haemolymph while vitellins are the main haem-binding protein in the ovaries. First, it is known that the genome of Ixoides scapularis is not completely finished and is not annotated at the level representing the standard in the field.listed genes were incompletely predicted and supported by few RNAseq (please compare T. urticae homologs) it cannot be excluded that the remaining 3 genes are present but in the portion of I. scapularis genome that has not been completed or not well annotated. [...] Thus, an additional analysis and re-interpretation of data is necessary to support major conclusions of this paper. We are grateful to the reviewer for his/her guide and advice regarding the mapping the haem biosynthetic pathway in I. scapularis using the orthologues from another mite, namely T. urticae. We agree that I. scapularis genome is still not perfectly annotated and contains a lot of gaps. In the previous manuscript, we only referred to the genes of haem biosynthetic pathway present in the KEGG database. Based on the reviewer’s suggestion, we performed a much more detailed data mining and BLAST analyses in available mite genomes as described in the paragraph 1 of this appendix. Moreover, we confirmed transcripts of identified genes sequences by finding the corresponding orthologues in I. ricinus tissue transcriptomes. This led to additional identification of PPOX as a third gene of the tick haem biosynthetic pathway that was not revealed by KEGG. The reviewer found also other two genes related to T. urticae ALAS and UROD. Our phylogenetic analysis unambiguously revealed that these two genes are of bacterial origin. A great hint from the reviewer #3 was the note about the lack of haem oxygenase (HO) in T. urticae. We further confirmed that absence of HO is a common feature among other Acari. This certainly makes indefensible our previous hypothesis that lack of HO presents another feature of tick adaptation to the haem-rich diet. In the light of a general absence of HO in Acari genomes, we may rather speculate that the inability to acquire iron from haem pushed the tick ancestor into haematophagy, and allowed the loss of haem synthesis as HO-mediated haem degradation is the major source of iron in most organisms studied up to now. Supplementation of serum with haemin (soluble haem chloride) instead of haemoglobin (Hb) would be a more straightforward rescue experiment. However, addition of haemin into the diet is a non-physiological over-simplification that does not take into account the complexity of the tick digestive system. Unlike haematophagous insects, ticks digest blood meal intracellularly and haem is released from digested haemoglobin inside the digestive (lysosome-like) vesicles of the tick gut digest cells. This was the main reason why we performed the rescue experiment using pure commercial haemoglobin. Consequently, ‘no haemoglobin in the diet – no haem in the eggs – no embryonic development’ is, in our opinion, strong enough evidence that haem needed for tick reproduction originates exclusively from host haemoglobin and no other component of the host blood. Irrespective of these considerations, we tried to verify what would happen if ticks were fed on serum supplemented with haemin, as suggested by the reviewer. Therefore, we performed the experiment as suggested by the reviewer. We prepared diets with 625µM (HH – high haemin) and 62.5µM (LH – low haemin) haemin in the serum, corresponding to a concentration of 1% and 0.1% w/v haemoglobin, respectively. Ticks were fed for the first five days on pure serum and from day 6, they received haemin-supplemented sera. Ticks were able to fully engorge and lay eggs under both conditions. Laid eggs were used for determination of haem concentrations by HPLC (Author response image 2). Interestingly, haem concentrations were about the same in eggs from HH- and LH-fed females. We have no clear interpretation of this result. We assume that haemin uptake might be facilitated through haem-binding serum proteins (e.g. albumin, haemopexin). Similar haem concentrations in egg clutches of HH and LH ticks may be attributed to limited haem-binding capacity of serum proteins. A quantitative correlation between haemoglobin (haem) concentration in the diet and the number of hatched living larvae is quite difficult to determine. We routinely estimate the larval hatching rate by crosses +, ++, and +++ for low, medium, and high numbers, respectively. There is great variability in larval numbers, even for naturally fed ticks, and we further noted that there are also seasonal variations in clutch sizes and the time needed for larval hatching. Therefore, it is not feasible to reliably evaluate differences in hatching from in vitro fed females in relation to haemoglobin concentrations over a reasonable time frame. In the case of the triatominae bug Rhodnius prolixus mentioned by the reviewer, RNAi-mediated silencing of haemolymphatic haem-binding protein (RHBP) resulted in the laying of viable red eggs and non-viable white eggs in earlier and later stages of oviposition, respectively (Walter-Nuno et al., 2013). In contrast, ticks fed on different haemoglobin/haemin concentrations laid fairly homogenously colored clutches of eggs (Figure 2, Figure 2—figure supplement 2 and Author response image 2). To this end, we did not observe any obvious difference in larval hatching from individual parts of any egg clutch. We believe that we have sufficiently demonstrated in our manuscript that haemoglobin is strictly required only as a source of haem needed as the prosthetic group for endogenous haemoproteins (see Supplementary file 1). Nevertheless, we thank the reviewer for his/her proposal to perform an additional experiment to replace haemoglobin with myoglobin in the diet. Despite this non-physiological situation, it appears that ticks, indeed, are capable of acquiring haem from myoglobin and can transport it to the developing oocytes (Author response image 2). As in the case of haemin, it is not clear whether the uptake of myoglobin by tick digestive cells follows the proposed haemoglobin pathway via the putative specific receptor-mediated endocytosis or is absorbed non-specifically by fluid-phase pinocytosis proposed for serum proteins. Further studies are planned to answer this question. Experimental feeding in vitro of I. ricinus females on serum supplemented with myoglobin or haemin. Ticks were membrane fed in vitro on bovine serum (S). Pure equine myoglobin (Sigma, M0630) or haemin (Sigma, H9039) of specified concentrations were added to the serum diet from the 6th day of feeding and feeding was then resumed until tick full engorgement. The fully engorged females were weighed, allowed to lay eggs, and haem concentrations in eggs were determined by HPLC. (A) – representative females fed on respective diets laying eggs; note the different female coloration due to distinct amounts of haem in the diet, yet egg clutches are similarly coloured. (B) Weights of fully engorged females fed on respective diets; each symbol presents the weight of one fully engorged female; bar charts depict the mean ± SEM. (C) Levels of haem b were determined by HPLC in egg homogenates from ticks fed on sera supplemented with 1% w/v myoglobin, 625 μM haemin, 62.5 μM haemin, or pure serum. Data (mean values ± SEM) were acquired from homogenates of three independent clutches of eggs. For further details see the Material and Method section. This is definitely a correct suggestion, but unfortunately unfeasible under the current state-of-the-art of tick artificial feeding. Our efforts to manipulate the serum diet usually resulted in a failure of tick feeding. For instance, ticks do not feed on serum that has been dialyzed (removal of low molecular weight components). On the other hand, ticks can be partially fed on a serum ultrafiltrate (< 3 kDa), however they do not commence the rapid engorgement (‘big sip‘) phase in the absence of serum proteins. Hence, we have so far failed to establish conditions of limited iron supply in the tick diet. Currently, implementation of a defined artificial tick diet, similar to that found for Aedes aegypti (Talyuli et al., 2015), seems to be the only way to experimentally approach the question of the source of iron and other essential nutritional components. “As this method is not able to distinguish between iron of haem and non-haem origin, only salivary glands and ovaries dissected from partially engorged BF and SF ticks were used for the analysis to avoid distortions caused by the presence of haemoglobin in the samples”. Our estimation of the quantity of total haem acquired from a blood meal (~10 µmol) was based on the following calculation: A fully engorged female imbibes approximately 1 ml of blood meal containing ~150 mg haemoglobin (2.32 µmol) and each haemoglobin molecule contains four haem rings (~10 µmol). The average haem content in eggs from ticks fed on whole blood was approximately 600 pmol/mg, which, when multiplied by the weight of a typical egg clutch (100–150 mg) yields 100 nmol of haem. We have examined the available RNA-Seq data from I. ricinus salivary glands and midgut transcriptomes (Kotsyfakis et al., 2015) and found that ir-cpox, ir-ppox and ir-fech are indeed expressed in this species (Author response image 3A). To obtain a deeper insight into putative functions of encoded proteins, we have carried out expression profiling of ir-cpox, ir-ppox, and ir-fech over tick active developmental stages (larvae, nymphs, adult males and females) (Author response image 3B) and tissues dissected from partially-engorged females (Author response image 3C). Genes ir-cpox and ir-ppox showed the highest expression in unfed larvae and in ovaries from partially-engorged females, while the ir-fech transcript was detected in all cDNA sets examined. As all three genes have retained mitochondrial target sequences (based on TargetP prediction), we speculate that the encoded proteins might have adopted certain functions in mitochondrial biology, possibly distinct from haem biosynthesis. Similar qPCR expression profiles of ir-cpox and ir-ppox suggest that at least two encoded proteins (CPOX and PPOX) may be part of the complex metabolon (Medlock et al., PLoS One, 2015). Expression of coproporphyrinogen-III oxidase (ir-cpox), protoporphyrinogen oxidase (ir-ppox), and ferrochelatase (ir-fech) in the tick Ixodes ricinus. (A) Expression profiles of nymphal and female adult I. ricinus stages over initial phases of feeding from available RNAseq data (Kotsyfakis et al., 2015). SG – salivary glands; MG – gut; N – nymph; A – adult; 12, 24, 36 – 12, 24, 36 hours of feeding. (B) qPCR analyses of ir-cpox, ir-ppox, and ir-fech expression profiles over active developmental stages of I. ricinus and (C) over tissues dissected from partially-engorged females fed for 6 days (C). Data were obtained from three independent cDNA sets, and normalized to elongation factor 1α (ef1α). UF – unfed; FE – fully engorged; SG – salivary glands, OVA – ovaries; Trachea – trachea-fat body complex; MT – Malpighian tubules; Rest – remaining tissues. Mean values +/- SEM are shown. As already mentioned in our response to point 2, we could not find any way to deplete transferrin from bovine serum without the manipulation leading to a failure of tick feeding. Instead, we increased the amount of transferrin in bovine serum by addition of 3 mg/ml of commercially available holo-transferrin. Addition of this iron-saturated transferrin to the serum diet led to a corresponding increase in intestinal ferritin 1 used for monitoring the levels of bioavailable iron, as described earlier (Hajdusek et al., 2009) (Author response image 4). This experiment indicates that ticks are indeed capable of acquiring iron from host transferrin. However, it is still not clear whether the host transferrin is the exclusive source of bioavailable iron for ticks. Answering this question on the source of iron for ticks lacking the haem oxygenase gene is a challenging task for our future research, possibly based on using defined artificial diets as discussed in our response to point 3. Increased transferrin levels in serum led to higher levels of ferritin 1 in tick gut. Ticks were fed on serum or on serum supplemented with 3 mg/ml of bovine holo-Transferrin (Sigma, T1283). This addition increased the concentration of transferrin in serum approximately 2-fold, whereas the amount of transferrin iron was increased 3‒4 fold (iron saturation of natural transferrin in serum is usually about 30%). (A) SDS PAGE of diets (10 µg per lane) used for the experiment: S – serum; S+Tf – serum with added 3 mg/ml of iron-saturated transferrin, stained with Coomassie blue (CBB) and Western blot with anti-transferrin specific antibodies (αTf). (B) SDS PAGE of gut homogenates dissected on the 4th day of feeding (Day 4) and from fully engorged females (Day 8) visualized using the TGX Stain-Free technology (TGX) and Western blot detection of tick ferritin 1 levels using specific antibodies against recombinant I. ricinus ferritin1 (αIrFer1). 8) The hypothesis in L72-274 stating that hemoglobin and serum proteins are endocytosed within gut cells via distinct mechanisms is not supported by solid experimental data, so please modify the statement. The reviewer is correct in saying that the concept of separate haemoglobin uptake via receptor-mediated endocytosis involving clathrin-coated pits and fluid-phase endocytosis for serum proteins (e.g. albumin) has not yet been unambiguously proved. Also the haemoglobin receptor expected to be present on tick digest cells has not yet been identified. Due to the uncertainty in this matter, the corresponding part of the text was removed from the Discussion. We agree with the reviewer that vitellins are not haemoproteins in the strict sense as they apparently do not need haem as a prosthetic group for their function. The same is true for HeLp, the haemo-lipoprotein in tick hemolymph IrCP3. Given their lipophilic character, these low-density lipoproteins function as haem scavengers, and most-likely as transporters and storage proteins for insoluble haem. Based on this, we replaced the term ‘haemoprotein’ by the term ‘haem-binding proteins’ where appropriate. Based on the fact that haemoglobin makes up about 70% of total blood proteins, it has long been assumed that haemoglobin was an indispensable source of amino acids for the production of yolk proteins. For this reason, our research over the past decade was focused mainly on haemoglobin digestion as a potential target for anti-tick intervention. However, the results presented in this work show that ticks can produce an equal amount of vitellogenins and eggs even in the absence of haemoglobin. In order to make this surprising result more obvious we changed the corresponding sentence in the following way (see lines 264‒266) ‘These experiments surprisingly revealed that haemoglobin, which makes up about 70% of total blood proteins, is not a necessary source of amino acids for vitellogenesis (Figure 2 and Figure 3)”. We thank the reviewers for this helpful suggestion. We have removed some parts that were not tightly associated with our results and that possibly would be more appropriate to be discussed in a review article concerning other haem auxotrophic organisms. We believe that the discussion is now more focused on blood-feeding arthropods without losing general interest for other biologists. This work was primarily supported by the Czech Science Foundation (GA CR) - grant No. 13-11043S to PK and, additionally by grant No. 14-33693S to DS, postdoctoral grants 13-27630P to OH and 13-12816P to RS. JP received support from the Grant Agency of the University of South Bohemia No. 074/2014/P. R.So. was supported by the National Programme of Sustainability (LO1416). The research at the Institute of Parasitology, BC CAS is covered by RVO 60077344. We thank Prof. Hendrik Küpper, Institute of Plant Molecular Biology, BC CAS for analysis of elemental iron by GF-AAS. We acknowledge the excellent technical assistance of Matěj Kučera, Lenka Grunclová, Jan Pilný, and Jan Erhart. Animal experimentation: All laboratory animals were treated in accordance with the Animal Protection Law of the Czech Republic No. 246/1992 Sb., ethics approval No.095/2012. © 2016, Perner et al.